I'll admit something to you right now. I sometimes get embarrassed of this little food blog here. Sometimes I get self conscious when I talk about it in the 'real world' and sometimes I'd rather people not bring it up. Not because I'm ashamed or anything, but because it is kind of a weird hobby. I mean, a hobby without much of a lineage, as far as hobbies go. Cooking, knitting, reading, running, all acceptable hobbies in which people have been engaging for ages. No one questions them. But food blogging? What is that even? You mean you make things and then take pictures of your food and them post them to the internet? Weird. I know. So if someone I already really like, or someone I don't want to think of me as strange, cops to having a food blog first, I'm almost giddy with delight. Me too!! Me too, me too, me too. I have one too. And then I don't have to mumble something only half audible when they ask me how the food blog is going. I don't have to justify it because they already know. And honestly, this little blog has given me a lot. It's helped to teach me how to cook. It's made me more aware of what I eat, made me more adventurous, and it's given me these beans. Actually, my friend N gave me these beans, because it's her husband who also has a somewhat-defunct-but-I-hope-he'll-resuscitate-it food blog. So I'm not too self-conscious to talk about mine when I'm around them. Sometimes I half-jokingly berate N's husband for not blogging more of her family's Serbian recipes, the kind of recipes passed down through generations. The kind of recipes food blog dreams are made of. So when they mentioned that these beans are their favorite, that they're the baked beans N grew up with and that her parents still make, I demanded the recipe (nicely, of course) and vowed to share it. 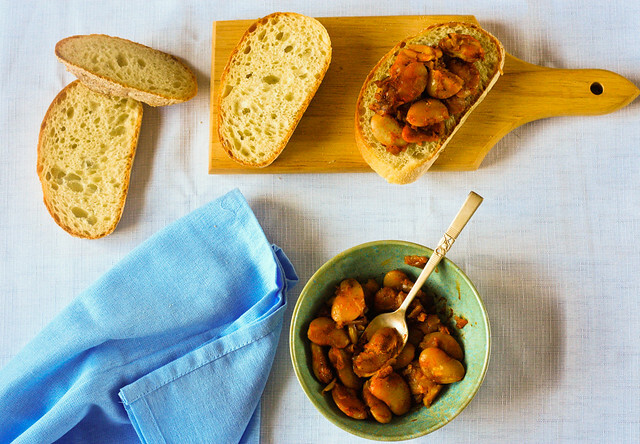 Prebranac are Serbian baked beans: lima beans simmered on a bead of onions, spiked with sweet Hungarian paprika, and then baked. N said you could use either sweet or hot paprika, but that sweet is the usual. She also warned that the top layer of beans, once baked in the oven, should be fairly dry, most of the moisture having evaporated, and not at all soupy. 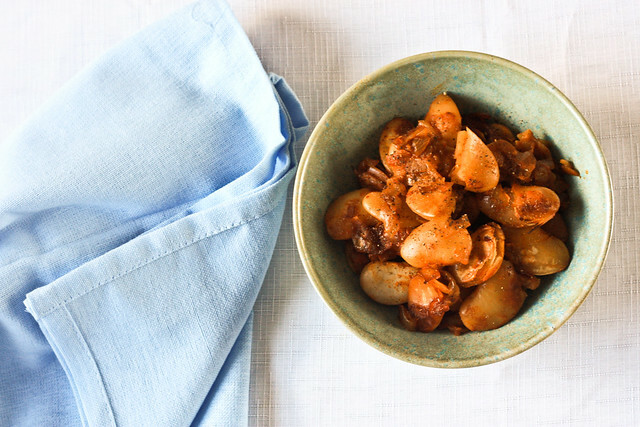 The beans themselves become wonderfully creamy and coated with onion. The recipe is just exactly as precise as an heirloom family recipe should be. This is honest, basic food, that is not going to punish you for not measuring things out. It's probably not traditional, but if you're going to substitute Prebanac for a meal, rather then serving it alongside something else, it is quite wonderful over good crusty bread, kind of a kicked up beans and toast. When done the beans should be thick and creamy, not soupy at all - so if you end having too much liquid which does sometimes happen, just pour out some of the liquid and adjust seasoning. Okay, I can totally relate to feeling self-concious about telling people about my food blog. Actually, I don't usually tell people - my husband always brings it up! That being said, I do have it listed on my resume - I'm a writer. I normally don't like beans; in fact, I've hated them my entire life. 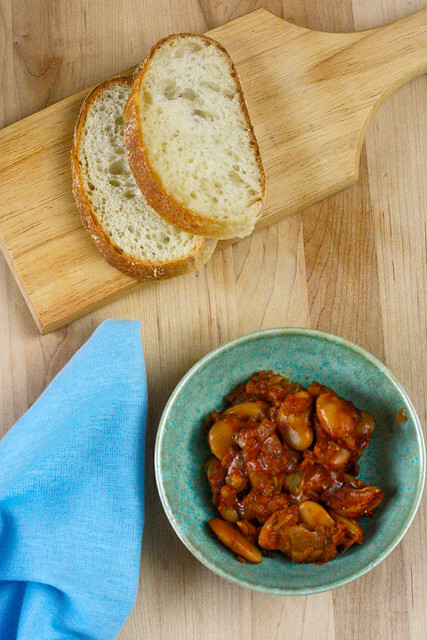 However, now that I have a few pounds of dried beans sitting in my cupboard after a cassoulet cookoff that I entered, I'm looking for more ways to cook them. I do enjoy them, and think they are an excellent protein, but they do take getting used to! 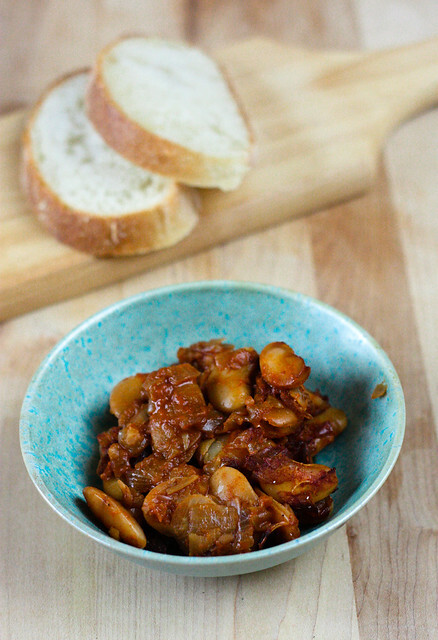 This dish looks amazing and I'll be adding it to my beans list! By the way, the name of the now-defunct food blog you mention is awesome, so I hope it gets resuscitated too before someone snatches the name away! Here I'm reading your post and nodding, and then I read Lisa's comment and, whoa, that's exactly true, too! It's not that I'm ashamed, but I feel that some people might think I'm wasting my time, and that I could be using the time I blog on something more meaningful or necessary. Oh well. Love this recipe and will be giving it a try soon. The creamy giant white beans are some of my favorites! These are very lovely food photos. It just made me hungry! Thanks a lot for these. That's the real thing!!! Obozavam prebranac, gravce na tavce (like it is coled in Makedonia)!